I can’t believe that I had overlooked this application at first, but I’m glad that I finally started using it. 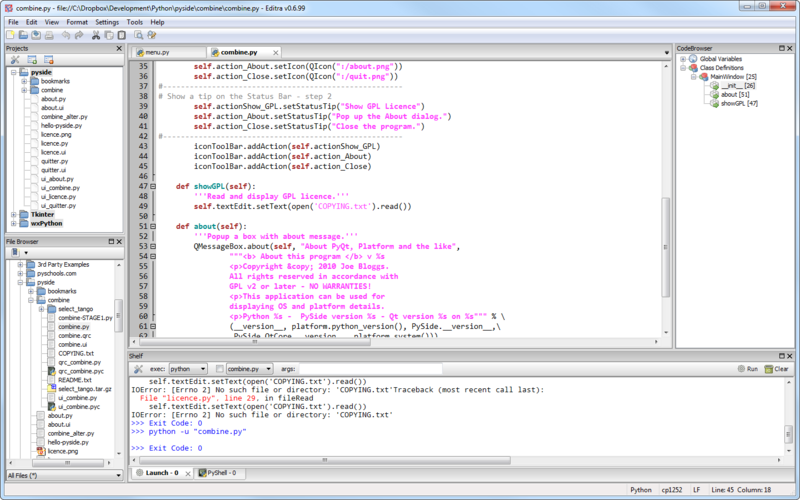 So far, this is the best free Python IDE that I’ve found, and it’s a fantastic general text editor as well! Until Microsoft come up with an official solution there is a working workaround for this problem. This problem only appears to affect people who have not got Visual C++ Installed. 3.) Wait for the error message to come up – DO NOT CLOSE THE WINDOW! 4.) Copy the temp. folder where the patch has been unpacked to a new folder, for example onto your desktop. 6.) Navigate to <drive>:\Program Files\Microsoft Visual Studio 9.0\Common7\Tools and find vsvars32.bat. 7.) Change the permissions on the file to allow everyone to edit it. 8.) Start VS90SP1-KB971092-x86.msp from within the saved folder and the process should complete. Thanks to Benjamin Michael Novakovic for this fix! via Benjamin Michael Novakovic » jQuery fadeIn/fadeOut IE cleartype glitch. It’s also worth noting that Safari and Chrome (well, anything rendered with Webkit, it seems) have an excellent set of development tools built-in that are very similar to the functionality of Firebug in Firefox, and even IE8 is catching up to the game with its Developer Tools window/pane. Since Internet Explorer is the scourge of the Interwebs that will never go away, it helps to be able to test your site in multiple versions of IE, and since only one version can be installed at a time (and since IE8 Compatibility Mode doesn’t really help at all), IETester is a good solution that lets you test IE5.5, IE6, IE7, and IE8 rendering engines in the same tabbed browser. Very cool. …But, as my coworker mentioned, Internet Explorer is pretty invasive and modifies more on your system than just the rendering DLLs, so it’s a good idea to keep a spare VM running each flavor of IE as well. VMWare Player is the free version of VMWare Workstation, which will run pre-existing virtual machines, but can’t create new ones. Since that functionality is missing from VMWare Player, you can use this site to create your own virtual machines from scratch: EasyVMX! Virtual Machine Creator. Ian Hickman’s post (6 Free Tools that every Windows Programmer should Install) suggests Process Explorer alone, which is a superior Task Manager replacement, but I’ll extend it to suggest the whole Sysinternals Suite, since it comes with so many other great utilities and includes Process Explorer along with them. One of my favorite tools besides PE is AutoRuns, which is a msconfig.exe replacement that offers a much better look at your startup apps and services. TortoiseSVN comes with its own diff tool, but I tend to end up using WinMerge instead because it does a great job with comparing local files or differing versions of a file in source control, and integrates seamlessly with TortoiseSVN. I’m definitely a keyboard junkie, so anything I can do to keep my hands on the keyboard is a plus. Launchy is by far my favorite application launcher for that reason. All I have to do is hit Alt+Space (you can reassign the hotkey if you like), and it brings up a prompt that allows me to launch anything on my Start Menu, and do a number of other tasks as well (launch websites, perform quick calculations, etc.). Definitely saves me a ton of time. All three of the apps listed above are excellent full-featured text editors, but I prefer the feature set of EmEditor, which is a paid application. The killer feature that EmEditor provides which I haven’t yet found in either of the other editors is the Find *and Replace* in files. Notepad++ has a Find in Files option, but I haven’t found a Replace in Files function without opening up every single document and performing a replace in all open documents (info on that approach here: How To “Find And Replace” Words In Multiple Files). Notepad2 doesn’t offer the same tabbed document interface that both EmEditor and Notepad++ offer, but it is an incredibly lightweight, and more importantly, self-contained executable that’s a perfect drop-in replacement for Windows Notepad (info on how to do this here: Replace Notepad with Notepad2). Any of these apps offer syntax highlighting and are a great alternative to firing up Visual Studio when you need to make a quick edit (or on one of the *many* occasions when Visual Studio slows waaaaay down or locks up your system). YouTube – Samsung SSD Awesomeness.